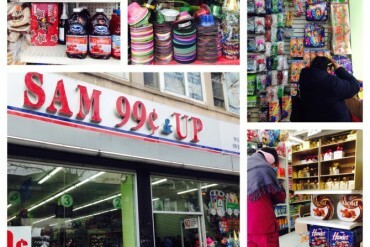 In the middle of the busy environment, Mohammed Idrees, manager of Sam 99 Cents & Up, shares with us a little of his experience at this store, which opened its doors to the neighborhood since 2002. Having a large experience in 99 cents stores, the owners chose this location because of its activity and proximity to the train station. The store opens at 9 am. Mohammed coordinates duties helping from the cashier, along with two girls who stay there permanently during their shifts to help the line move fast and to take care of the customers effectively. Mohammed has as a priority the satisfaction of everyone who visits the store. He intends to listen to all questions and comments that people express, either to improve their service or to bring products that someone might have not found in their visit. The variety of products is as large as the store itself. From food, tools, household and personal care products, to seasonal items for each holiday. Two months prior to every holiday, the storage fills up with the proper merchandise. Halloween, Thanksgiving, Christmas and New Years are definitely the top favorites of the year. The seasonal aisle is always in the same place, providing easier identification to the customers. Of course, the prices are the main attraction to the store and the reason to always find it crowded, which the owners appreciate, showing a great satisfaction to be in this location. With eight employees, Sam 99 Cents & Up highlights on 82nd Street due to their efficiency, their capacity to reinvent themselves daily and the kind service they provide to their customers. En medio del ambiente ajetreado, Mohammed Idrees, administrador de la tienda Sam 99 Cents & Up, nos comparte un poco de su experiencia en este local, que ha abierto sus puertas al vecindario desde el 2002. Con una larga experiencia en tiendas de dólar, sus dueños eligieron esta ubicación por su gran actividad y su cercanía a la estación del tren. La tienda abre a las nueve de la mañana. Mohammed coordina las tareas ayudando desde la caja, junto a otras dos chicas que permanecen allí para agilizar las filas y atender efectivamente a los clientes. Mohammed le da prioridad a la satisfacción de todo aquel que entra a la tienda. Procura estar pendiente de las preguntas y comentarios que la gente comparte, ya sea para hacer mejoras en el servicio o traer aquellos productos que alguien no haya encontrado en su visita. La variedad de producto es tan amplia como la tienda misma. Desde comida, herramientas, productos del hogar y artículos de uso personal, hasta artículos alusivos a las festividades. Dos meses antes de cada fecha especial, la bodega se llena de la mercancía correspondiente. Halloween, Acción de gracias, Navidad y Año Nuevo son definitivamente los favoritos del año. La sección de temporada está siempre en el mismo sitio para fácil reconocimiento del cliente. Por supuesto, los precios son el mayor atractivo de la tienda y la razón para verla siempre llena, lo cual aprecian sus dueños, quienes demuestran gusto de estar en esta área. Con sus ocho empleados, Sam 99 Cents & Up se han distinguido en la calle 82 por su eficiencia, su capacidad de reinventarse a diario y el amable servicio a sus clientes.